The ITINs with the digits 70, 71, 72, 78, 79 and 80 as medium digits expired in 2016 and 2017. 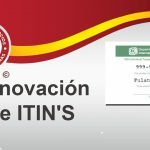 In addition, all ITINs issued before 2013, with the digits 73,74,75,76,77,81 and 82, will expire at the end of this year. Marchino Group Inc Tax Service is open Monday through Friday (10:00 am – 6:00 pm) to complete the renewal of your ITIN. We are ITIN Certified Acceptance Agent (W7).